We checked out of our Amman hotel today. We were practically the only guests. It was like the quieter parts of "The Shining." The drive today was gorgeous, despite the mainly cloudy weather. At first, we saw more of those hardscrabble Jordan hills: not rock-covered, nor-tree covered, they are equal parts small rocks and small trees, like they're battling for supremacy. That stretches as far as you can see, and wherever it's just rocks, that's been plowed for farming. Susistence agriculture, I imagine. 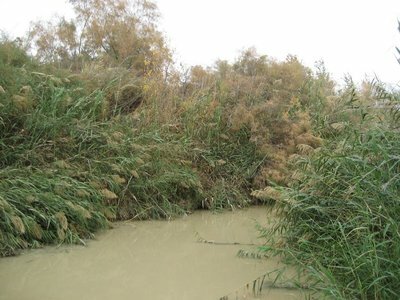 Soon, we'd driven down into the Jordan Valley (yup, a couple more checkpoints) and saw the site where John baptized Jesus. You have to use your imagination for this one; it's pretty much just a spot in the Jordan River, but I did reach down and stick my hand in. It's just cool being in the Holy Land (we also saw the spot where Elijah ascended to heaven, and we looked across the river to Jericho), where every place name is instantly recognizable from the Bible. After that, we watched as the outside temperature gauge rose to 18 degrees celsius. We'd driven to the lowest place on Earth: the Dead Sea. And, it was warm enough for a swim! Not really, but how could we miss this chance? Luckily, the water was warmer than the air. We stayed in for quite a while, enjoying the famous buoyant effect. We even had a pamphlet to read for the obligatory photo-op. Not quite being able to shower off the salt properly, we nonetheless rolled on, to our stop for the night: Madaba. But first we drove up from 400 metres below sea level and had some more great views. We even passed by Mount Nebo, where Moses was shown the Promised Land (then died, but he was 120 and didn't have a Ford Explorer). Arriving in Madaba, we saw the incredible "Madaba Mosiac" on the floor of the St. George's Greek Orthodox Church there. It's a tile mosaic map showing all of the Biblical lands. It was made in the 6th century, and about a third of the two million pieces survives. It showed all sorts of places we've just been, like the Dead Sea, with boats in it, fish in the Jordan River, and the Nile Delta. Some places are enlarged and more detailed, like Jerusalem, where the tiling shows the walls of the city and even individualized buildings. All the place names are in Greek, so it's a good thing we had our guidebook. I've never seen anything else like it, considering it's 1500 years old. Madaba since then has maintained a tradition of mosaic-making, so the rest of the church is pretty amazing too. It's a small town, so we found a recommended hotel pretty easily. But it is seriously off-season (it may have been 18 degrees by the Dead Sea, but it was around 6 degrees in Madaba at night), and the hotel's restaurant showed no signs of life. Driving back through town, we walked the main street, and still found nothing. But we chanced one more block and entered a courtyard restaurant complex called "Haret Jdoudna". Still deserted. We were just about to leave when a waiter beckoned us inside. To our delight, we found a wedge-shaped room, full of diners, warmed by a crackling fire. The food was fantastic too, perhaps the best meal we've had in the Middle East so far. 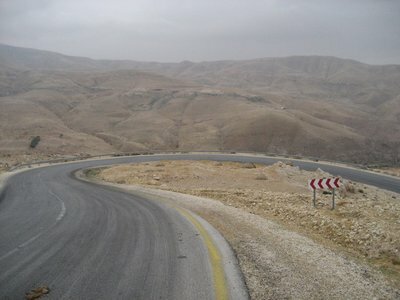 The King's Highway in Jordan, 2008, is newly-paved. 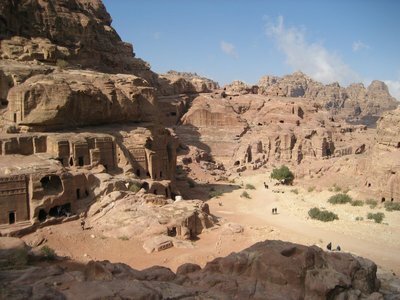 But it's seen a lot of traffic long before there were cars: Moses led his people along this route, traders came to and from Petra at its Nabatean peak, pilgrims and Crusaders of the Christian variety, and pilgrims to Mecca, too, have longed followed a similar passage. Today it was our turn. Unfortunately, the twists, turns, switchbacks and elevation change didn't help Anica avoid feeling carsick. So we propped her up on a pillow in the front-seat and she seemed much better after that! Illegal in Canada, practical here. 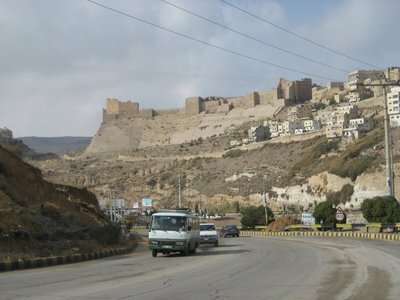 We reached the city of Karak before noon, and promptly checked into a hotel right beside the Karak Castle. The Karak Rest House. 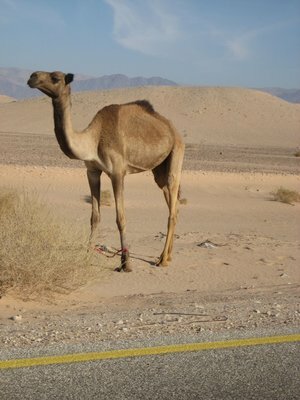 James had stayed here on his last trip to Jordan. Hello Mister James! We now have a panoramic view of the deep Wadi Karak (a wadi is a dry river valley). The manager said he'd turn the heat on later for us. After a picnic in Jenn's Dad's room, we went over to the castle. It was built in the 12th century by Crusaders, and laid siege to by Saladin in 1183. Parts of the castle, built after the Crusaders lost this area, are Mamluk ruins, anywhere from the 1300s to 1500s. The Mamluks also controlled Egypt during some of that period. Again, sometimes coming in the off-season just rocks. We had this castle, which is one of the top sites in Jordan, practically to ourselves. There was so much you could freely climb and explore. The tunnels underneath the castle were particularly atmospheric: one gallery was a row of stores, and another was a row of prison cells. Lit only by air shafts of light, and the occasional modern electric footlight, we walked each tunnel alone. Various stone windows, cut for arrow use, looked out over the valleys on three sides of the castle (it's at the point of the wedge-shaped hill where the town of Karak is built). After hours of climbing every staircase and ramp, we finally declared ourselves done and back across the drawbridge to our hotel. We are their only guests tonight. We drove from Karak to Wadi Musa (the modern town by the ancient city of Petra) in a little rain and a lot of fog. Early in the drive the fog had lifted enough for us to enjoy some of the incredible wadi views from this stretch of the King's Highway. Rain was threatening to become a factor again when we reached the desolate Shobak Castle. Other than nearly colliding with a family car coming down from the castle, there was nobody else there. A couple of curator/tour guides were at the entrance, but it's free anyway. Shobak is another Crusader-built castle like Karak. We were really just there to stretch our legs, but James and I couldn't resist the long staircase down into the belly of the castle. Anica and Jenn came part way, and then we continued, with flashlights, down uneven steps. I counted 94 steps, before we doused the flashlights and looked ahead. No light at the end of the tunnel. We went back up. The fog got worse as we neared Petra. At least, we assumed we were getting closer as we couldn't see the road signs. The fog was so bad we could only see about two dotted lines ahead down the centre of the road. Finally, though, we made our way through a ghostly Wadi Musa, and successfully bargained for our desired price in hotel room. This place is well-heated! In the morning, I soon came to the conclusion that Petra is my favourite place of sightseeing (so far!) in the world. After a few hours of trekking and exploring, I was already thinking: this tops them all. On our first day we (without Jenn, who was experiencing the flu-like feeling I'd had a few days ago) started down "The Siq" in the morning. 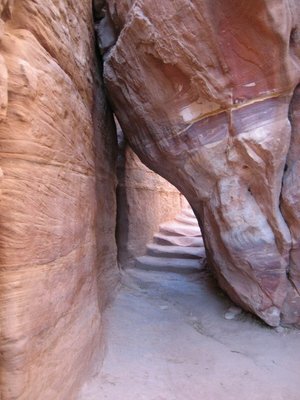 It's the long, twisty, narrow canyon that emerges at "The Treasury," the most-photographed place at Petra. Every time we turned a corner, we were thinking: "will this be it?" It was like creeping downstairs on Christmas morning to see what Santa brought. Along the way, though, I started to understand just how many tombs there are. From the moment you enter the front gates, you see holes cut into the rock, and beautiful, classical structures carved out of it. There are hundreds. 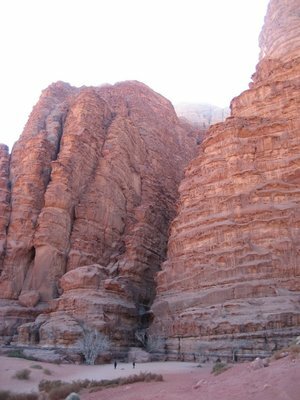 Also, all along The Siq, which is over a kilometre long, is an ancient, waist-high water-trough, which just serves to underscore the ingenuity of the Nabataeans, who built up Petra, starting from the 3rd century BCE. As you go, the rock gets more and more rose-pink. Anica in front of "The Treasury"
After spending some time admiring The Treasury, and climbing into a few cave-tombs, we set out for "The High Place of Sacrifice." It's well-named. There's an ancient staircase that took us up, and down a little, and then up, up (picture an Arizona-like landscape) to a plateau higher than anything else. We shared our snack food with some Arab men at the top. One of them looked around the vast landscape and proclaimed that "it's a miracle, this place." Then they danced, in a joyful chorus line! 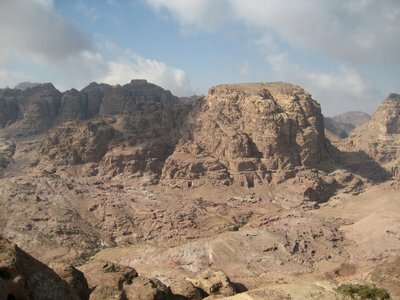 From this "high place," we could see back to the town of Wadi Musa, and forward to areas of Petra we hadn't yet seen. There were altars for animal sacrifice, and dugouts for washing up (washing off the blood?). Amazing spot, and I was really proud of Anica for her effort at getting up there. It was a little tortoise-and-hare, but unlike the hare, she finished the race, too, along with us tortoises. We decided not to go back the same way, but find the path forward, down the other side of the High Place. 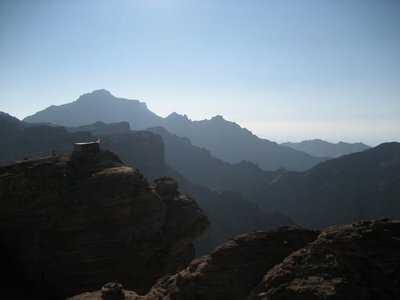 It was an hour hike from there to the ancient city of Petra's centre. The Roman influence was more noticeable there, with the colonnaded street, and the free-standing temple (the Nabataeans built everything by carving into the rock, almost nothing is free-standing). 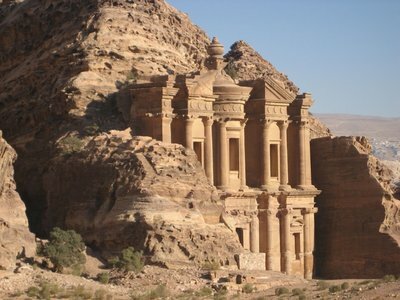 The Romans, however, didn't do much with Petra after taking it over. It became a lost city, lost to all except the Bedouins, who kept it secret. 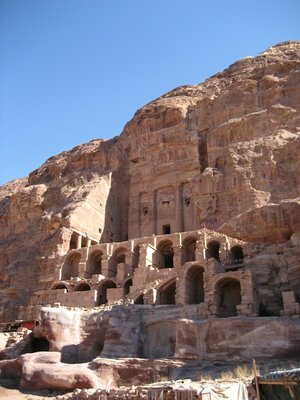 In the 5th century, there were a few Byzantine Christians who made churches out of the old tombs, and we saw these. 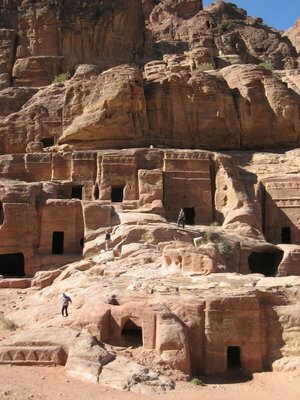 There's no evidence, as far as I could see, of how the Crusaders made use of Petra. 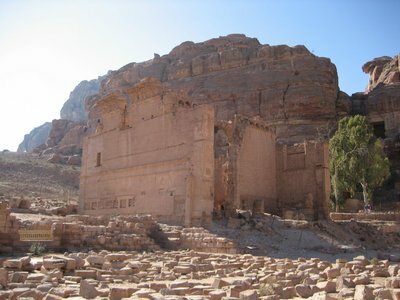 It wasn't until the 19th century that Europeans rediscovered Petra, as the forgotten, rose-red city. Artist David Roberts came here around 1840 and made his wonderful painting, realistic, but romanticized, too. They still sell his books and portfolios everywhere here, and I bought a collection of prints. On our way out, we stopped for a closer look at the pink/red amphitheatre. This was #5 in Anica's collection of amphitheatres seen, although she didn't get to climb this one. As the day went on, we had seen increasingly colorful rock; much of it striped, with a distinctive yellow band, also blue, white, and all shades of red and brown. The yellow crumbles quickly into sand. Anica bought one of those illustrations in a sand-bottle, and had the guy drop her name into it in black lettering. The second day, with Jenn (who was feeling better enough to say I can't miss this), we were even more ambitious. We had to walk in the same way; there's no other path from the front entrance. Then, we went up some steps to the Royal Tombs and had a little picnic. (In fact, we'd been stocking up on groceries, and have made our own breakfast in Jenn's Dad's room each morning. He has a little gas element, and can boil water, and has a frying pan for eggs. We've saved a lot, and had some memorable meals, by using James' camping stuff. Don't tell the hotel management!). The big trek of the day was to a spot known as "The Monastery." It's probably 500 steps up, plus some flat stretches of walking. Once you pass "The Monastery" building itself, which has "two stories" that are more like ten (I could barely climb up in the big door to the chamber), there's a few more steps (and I paused in the exact place that David Roberts painted The Monastery) that take you to a scenic lookout. The Jordanian flag flies as you stand, cliffside and look out for miles, maybe even as far as Israel. It's an incredibly rewarding view for the effort, though vertigo-producing. It took 90 minutes to walk back, with any real stopping, to our hotel. 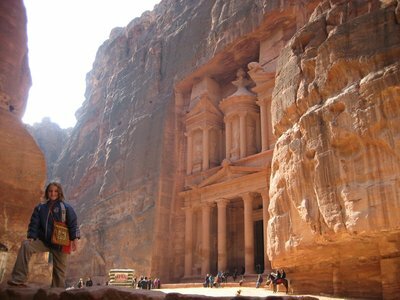 By the time we made it, we were certainly exhausted, but felt we'd really seen and done a lot of Petra. We just had the energy to get take-out shawarma (for the second night in a row from Al-Arabi restaurant, but it's so good from this place! ), and eat it back in our hotel room. We've been fortunate enough to have seen the Great Wall of China, Angkor Wat, the Taj Mahal and the Great Pyramids already on "our big world trip." 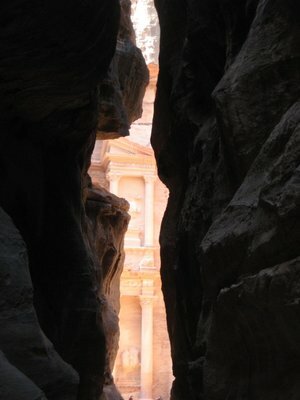 I've enjoyed them all, these wold wonders, but none more than Petra. 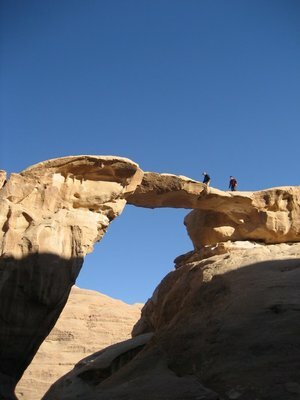 Wadi Rum is the third of three "must-see" experiences in Jordan (also Petra, and a swim in the Dead Sea). The operative word here is "must." When we got in the car this morning, the outside temperature read -6. The plan was to go camping. Hmmmm. Still, "must see." 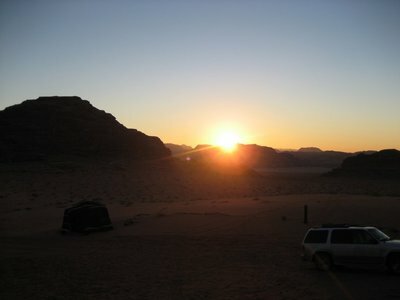 Wadi Rum is beautiful. It's a huge open-ended valley and dry-river bed, with many scenic canyons to explore. We hired a guide, encouraged by seeing the daytime temperature climb above 10 degrees (Hmmmm vs. "must-see" still duking it out at this point). 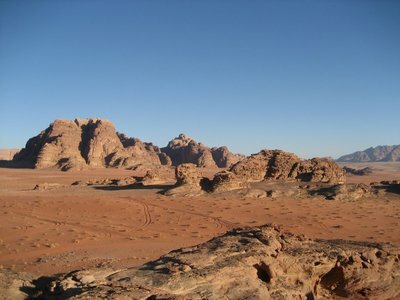 A "typical" Wadi Rum view! 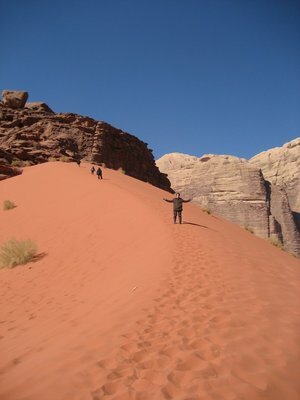 Our Bedouin guide led James through various sandy trails to some of the highlight spots in the Wadi where we could get out of the vehicle and explore. First, we climbed as far as we could into a narrow crack of a canyon. How far can you climb into the canyon? Then, we stopped at the foot of an enormous sand dune, and we climbed to the top, then ran down. James tried rolling down, but that just hurt. Anica was the only one of us to climb up a second time and run down again, screaming as loud as she could the whole way. At the base of another cliff, a couple of kilometres later, we stopped to examine some late Bronze Age drawings made on the rock. Lunch was a cookout/picnic in yet another towering, picturesque canyon. Anica played some more in the world's biggest sandbox, as James got a fire going. After lunch, we came to a natural stone arch that you could climb up to and across. It was about 40 feet up, but sure seemed higher from the top! Before sunset, we made it to camp. 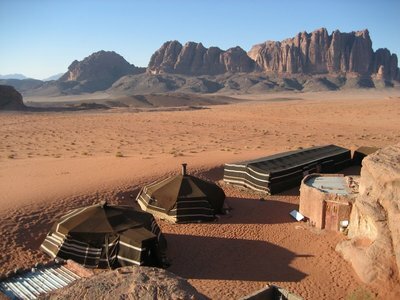 There are about 20 such sites in Wadi Rum, all owned by the heads of various Bedouin families. They all know each other, but it's competitive, because they're from about five different tribes. Ours was sheltered nicely from the wind. In all directions, if you just walked up the rocks, there were increible views. There were about 40 beds set up in the long, striped tents. The sleeping arrangement reminded me of a homeless shelter, or perhaps army barracks. In our camp, the arrival of sunset confirmed that we were the only campers that night. Our guide was joined by a friend, who arrived by pick-up truck, to help with the cooking. They cook the food by heating it in the ground, covered over. We didn't see this process, beause we were climbing rocks, and playing soccer (before dark), then warming ourselves by the fire in the round tent after dark. Our hosts served chicken, rice, pita, and a vegetable dish, along with chay (tea). They had lutes that they strummed on, and I had a try, but it was very different from the guitar. So, there we were, part of the timeless Bedouin tableau of sitting by your fire, enjoying your lute music, and watching videos on your cell phones. (?) Yes, these are 21st century Bedouin. Dressed completely traditionally, in their early twenties, they love their cell phones. They showed us how, if you walk to the edge of the tent, and hold your phone up high, sometimes you can get a signal. I thought it was hilarious, and when James tried to use his bluetooth to transfer a Britney Spears video, I thought we were contributing to the decline of civilization, but...what's authentic, really? If you were re-creating a Bedouin camp in a North American theme-park, the customers would be upset to see the "actors" on their cellphones. But to these young men, it's part of the life. As for getting through the night, we weren't that cold. Jenn was probably colder before she went to bed, and in general was feeling the cold more than any of us because she wasn't 100% healthy. I don't have the space here, though, to list all the layers of clothing and blanketing we used. Thank goodness we had our own sleeping bags, because with what they provided, we wouldn't have been warm enough. I'm sure it was below zero, because, after breakfast, when we drove away, it was still only two degrees on the temperature display. But we lived to tell the tale! Today we went to the Dead Sea and floted. It was very fun. First we went to Jesus Baptism Sight. It was neat, cool, and amazing. 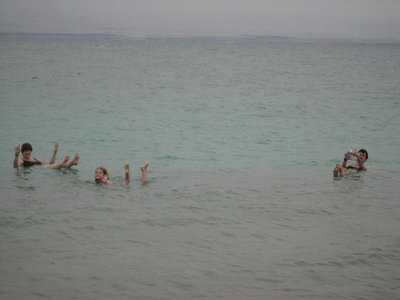 Then we went to the Dead Sea and floted. It was very salty, rocky, and fun! Then we went to a church with a mosiac floor map. It was colourfull, bright and fun. Then we had dinner at a place with a fireplace. It was very neat and warm after the 8oC whether! G.N. "Karak's King Poppa, King Dad, King Queen and Princess Anica at the Castle"
Today we went down to Karak. When we arrived we cheked into a hotel called Karak Rest-House. Right by the Al Karak Castle. And great view. Then we very yummy lunch of Chili, feta chesse, fruit juice and snickers. Then we walked out to the castle. 20 second walk! And saw, and climbed on very steep, ruined, rocky castle. We went into 10 dark tunnels! Then we went back home, had dinner, G.N. Today we drove to Petra. The drive to Petra was messed up in cloud like fog. When we got to Petra we got a 3-star hotel called Slk Road Hotel. Nice, warm, clean and good room. We went to a ver yummy and delicious and clean pizza place. Went home, had dinner. G.N. Today we went to the ruined, pin, high, twisty and big Petra. Mum did not come (sick). We went up a (approxamntly) 900 step high sacrifice place. We took lots of pictures t the pink, tall and nice and pretty Treasery. Petra the 2nd time. Today Mum came to Petra. We did almost the same thing but with a 1000 step climb to the Monnastry. Went home, had dinner. G.N. 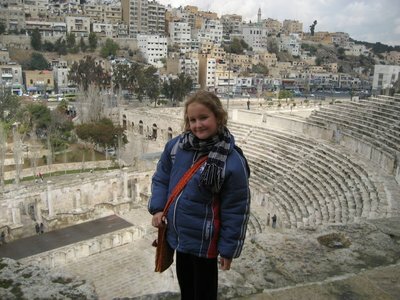 Anica at the Amman amphitheatre, the first of five we saw in Jordan. Out of Egypt for just an hour, we were quickly plunged into the next leg of our trip: two weeks in the Hashemite Kingdom of Jordan. Securing visas on arrival was easy, and the immigration officer only looked at one of our passports. But with countless changes to our flight times, we weren't sure if James (Jenn's Dad) would be waiting for us in arrivals. When we stepped out, he was nowhere in sight. But a young Arab man shyly asked us: "Is James your father?" This sounded like the password, so Jenn cleverly said "Yes." "He's just in the bathroom," Bashar (we soon were introduced) explained. Jenn's Dad had driven 1600 kilometres across the desert in his Ford Explorer to meet us. He'd booked a hotel, met up with his co-worker's family in Amman, and brought us many of the necessities we'd be needing for colder weather. 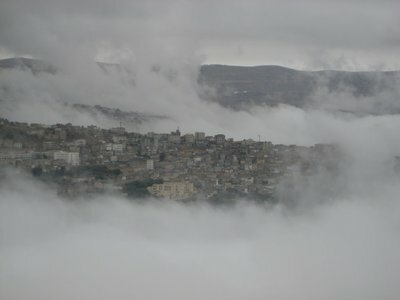 We didn't expect rain in Jordan, but we knew it would be colder, especially at night. James brought each of us a winter coat, hat, mittens, and scarf. Finally having a scarf, I got to practice my Bedouin look by draping and looping it over my shoulders in a dozen different ways! 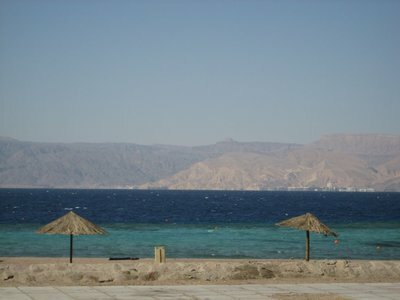 Somehow, we hope to experience some weather from each of the seasons: warm enough in the south to swim in the Dead Sea and snorkel in Aqaba. Today was as much like winter as we've felt since we left. Heck, since probably March's weather back in Canada. It's exhilarating, though, to be right in the thick of something totally different from our tour of Egypt. This travel variety, sometimes without any rest between stops, and sometimes with a good long quiet stretch is what's keeping all three of us from feeling burnt-out. After a brief stop at the hotel, which is a good fit (a budget two-bedroom suite, though unwelcoming, dimly-lit, and sporadically heated), we went right to the home of Hassem. Unfortunately, James' colleague had to go back to Riyadh yesterday, so once again it fell to the next generation to entertain us. They were certainly up to it! Welcomed into their apartment in Amman, Anica soon found her hair being braided by one Reema, one of the adult daughters. Rusha, another adult daughter, acted as hostess, and I was instructed to wobble my coffee cup back and forth when I'd had enough (Jordanian coffee is usually made with cardamon, and served in very small cups). We also had tea, all of us sitting in the "men's" half of the their living/dining area. The two sons (both in high-school) sat with us as well. I noticed around the corner that the "women's" area had the TV! But it's not strictly divided like a Saudi Arabian house would be. Then we went out to dinner, which meant Rusha and Reema had put their head scarves on. We went to a traditional Arab restaurant, where the circular tables have a sunken, brass-plated area for the platters to be put. With Rusha's help, James and I decided to order "Manshef," a common traditional dish in Jordan. It's stuffed lamb, served over a bed of rice and tomatoes, with a yogurt-like sauce to pour over it. The restaurant was extremely busy and smoky. Most of it was "hubble bubble" pipe-smokers, but generally in Jordan so far, it's the country with the most amount of public smoking. Even Rusha, who never smokes cigarettes, loves to have a hubbley-bubbley. We didn't stay up late enough, nor sleep in late enough, to qualify as "being on a Jordanian schedule." Nevertheless, Rusha and Reema, along with their youngest aunt, piled into the back seat of the Ford Explorer for a full day of showing the four of us around Amman. We started in the area known as Philadelphia, after the Ptolemy Philadelphius whom under most of it was built. Most striking was the Amphitheatre of 6,000 seats right in the middle of Amman. Because of the hilly streets, you get a great skyline view up to the Citadel on top of a plateau. It's probably the most photographed view in Amman. Anica liked it because we could climb all the way to the top of the steep stairs. And you could pose like a rock star on the "stage!" I liked our greeting there, because we were greeted by a unique set of chai-wallahs (in India, or whatever they call tea-sellers here). These men roved about, with an apron and armour of teapots. In the pockets of the apron are sprigs of fresh mint. I don't usually have mint tea, but this was warm and wonderful. It was like a candy salad floating in the tea! We took a quick look through two museums (keep tally, readers, because we're going to hit a grand total of five today) by the Amphitheatre, that had some of the "popular traditions" of dress, jewelry, etc. represented, we got in the car and drove up to the Citadel. By now the rain had picked up, joining forces with the temperature of not much more than zero. The Citadel, despite the hardships, turned out to be amazing. There's a ruined temple of Hercules that was built 161- 80 BCE, in the reign of Marcus Aurelius. From there, you can stand at a wonderful look-out point over most of old Amman. What caught my eye from there was the flagpole: it's the world's tallest freestanding flagpole, with a suitably huge Jordanian flag (although Rusha said today's flag was "the little one".). Then we ducked into an unassuming museum building, glad for the shelter. It turned out to house unbelievable antiquities, like Dead Sea scrolls, the oldest known human-made statues (they're from at least 6,500 BCE). There are trepanned skulls from the city of Jericho, too, which of course caught Anica's fancy for gruesomeness. Lunch was at another busy local restaurant, and then we had "knafa" at a street-corner stall. Most ate it standing up, and so did we. It was a delicious dessert. 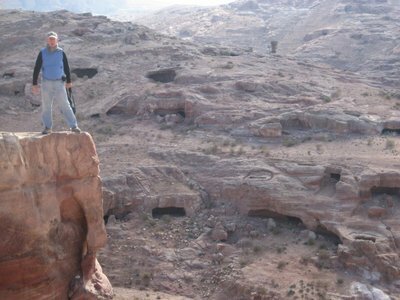 And, we probably never would have tried it if we weren't with our Jordanian hosts. Off to the Children's Museum next! A beautiful, brand-new facility like a "science/discovery centre," which many cities have, but this one is really good. It brought out the kid in all of us, particularly the "blue-screen" studio where you pretend to give a weather forecast. Next door is the Automotive Museum (and that makes five, right?). It's the collection of cars and motorcycles of the Jordanian Royal family over four generations. Wow! There's some rare cars there, like an electric car made in Detroit in 1907, a 1955 Aston-Martin (which Jenn and I both declared our personal favourite), Rolls-Royces, Cadillac convertible state cars, and some of the rally cars the King used. One of the notes said that "King Hussein won the first-ever rally held in Jordan." Well, duh! Who'd be brave enough to finish ahead of the king? Jerash today, a huge site of Roman ruins. We made a scenic drive north from Amman, seeing more of the rolling countryside of Jordan. In the centre of modern Jerash is the Roman town. Being off-season, there were probably only a couple of dozen people in a space that's more than a kilometre in length, and half a kilometre across. We saw a re-creation show (think "Roman Times," a variation on Medieval Times) in the part of the Hippodrome left standing. 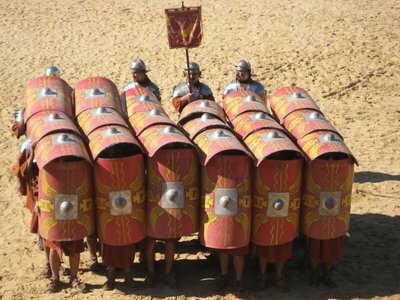 They showed Legionnaire formations, chariot races, and gladiator fights. We gave the thumbs up for mercy at first, but then we turned bloodthirsty. The Forum is oval-shaped, and quite intact. It's a huge, paved area, and out of it leads for me what was the main attraction: the "cardo maximus," or main road. It's almost a kilometre long, and well-colonnaded. We walked along cobblestones that had ruts in them from Roman chariot wheels. We peered into the original Roman manholes. It's an impressive thoroughfare to this day, and it was easy to imagine how it looked in antiquity. Once we got off the main road, there were many other areas to explore. We picked up bits of terracotta or carved stone (putting it right back where we got it, of course) because it was everywhere beneath our feet. With Anica, I played the game of "what's not from Roman times?" Jerash also has a huge Temple of Artemis, which alone would be enough reason to visit, and a well-preserved Amphitheatre (where, bizarrely, Arab-costumed bagpipers demonstrated the acoustics). At the entrance to the site, we paused for a photo-op under Hadrian's Gate, so named because it was built for the Emperor Hadrian's stay in Jerash in 130 AD. It's hard to imagine Roman ruins being any more extensive or evocative than what we saw today! Well, despite how I concluded yesterday's entry, we were off to see the ruins of another Roman town, Umm Qays. I guess we're not "ruined" yet, because all four of us explored with gusto at this very different-looking site. Partially, the appeal was the view. 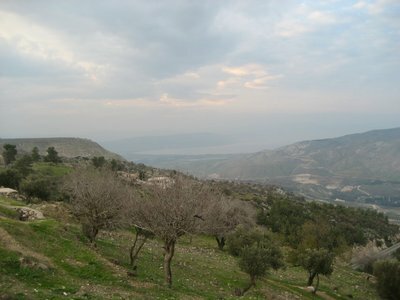 From the highest point of Umm Qays, which is at the extreme northern tip of Jordan, you look out over to the Sea of Gailee, and across a valley to the Golan Heights. In the distance are the mountains of Lebanon. It's a breathtaking view, but the frisson that the names produce heightens the enjoyment immensely. For Biblical scholars, and pilgrims through the centuries, Umm Qays is better-known as Gedara, where Jesus performed the miracle of casting demons into pigs. I didn't notice any demon-swine descendants, though. What we did see was the characteristic black basalt rock that the Romans built with. The Ottomans re-used a lot of it, as there's an 19th-century Ottoman village, already in ruins, where the same black basalt figures in every building. It gives the amphitheatre, the road, and many of the buildings quite a different appearance from Jerash yesterday. Anica and I took turns in the "stalls," or stores: "Hello olives! Yes?" I called out from the ancient stone cubicles. We explored the baths, climbed over what's left of the fountains, and wandered way out into the fields. A highlight is a 5th-century Byzantine basilica, itself a ruin, built over a Roman crypt. You can see the crypt through the foundation of the church. It's a long way down, and very dark in the vaults! As if further demonstration of the decline of Western civilization was needed, we had lunch by "tail-gating" out of the back of the Ford Explorer. It was actually very yummy, and somewhat comfortable (around 14 Celsius instead of yesterday's 3 degrees). There were more people playing soccer (sorry, football) in the parking lot than there were at the historical site, by the way. We decided to take an alternate route back to Amman, for the scenery. Ha! First of all it got dark, secondly, that route involved a lot more check-points. Like a checkpoint every 200 mere. Some were in clear view of the last checkpoint, where the soldier could have seen us hand our passports over for checking. Although our Canadian passports were well-received, the Saudi license plate caused a little confusion. James knew the Arabic for "I work in Saudi Arabia," however. Perhaps some dangerous man climbed out of the Jordan Valley in between checkpoints, though! In all, we went through 10 checkpoints, and had our passports checked each time. Eight of those came in the first five kilometres of the drive back to Amman. "A Roman Show and Museum"
Today we went on a very long and exciting drive to Jerash. A Roman (ruined) city. Firt we saw a chariot show at this place called the Hippodrome. Very exicting! Then we saw some very old road, ruins, cathedrels, churchs, arcs, gates, thetres, plazas, homes and baths. Then we went on another exciting drive back, had dinner. G.N. Today we went to Um Qays, same thing as Jerash. We saw the old and ruined baths, markets, churh, colonaded courtyard, nymphaeum, and others. When me and Mom were playing I pushed her and she pushed me, I went whhheeew! BONK! She pushed me over! And I hurt my arm and leg! And on the way back there were at least 11 checkpoints all 150 metres away from each other! Went home, had dinner. G.N. At just about the halfway point in a year of travelling, these thoughts have been taking shape in my mind. Lessons learned, as much about myself as about about the world. Lessons being learned, more accurately. We'll see how I feel after the second half of our travels wraps up. 1. Home really is where the heart is. I haven't missed home, or really experienced homsickness to the degree that I know is possible. And we've been gone for more than five months now. So why not? Simple: Jenn and Anica are with me. We're together, and that makes every hotel room a home. 2. Don't take things for granted. When you travel in the developing world, you see many, many people who have so very little. It makes you appreciate what you do have; it means you no longer take these things for granted. These sentiments are cliched, but I agree with them completely, except that "not taking things for granted" should not rule out complaining loudly at home when our rights and services are threatened. Canadians have an enormous tax burden, and, after travelling more widely, I see that it's worth it: the welfare of our citizens is safeguarded, our infrastructure is excellent, and we suffer a minimum of government corruption. If we start accepting less, we will get less, and only the extremely wealthy will ever enjoy a standard of living that Canadians once, to re-coin the phrase, took for granted. 3. They are "must-sees" for a reason. There are many people, including a whole breed of travel writers, who will blithely advise you to skip certain world-famous sites, because they've become over-run with tourists. That's like Yogi Berra saying "nobody goes there any more; it's too busy." There's a reason people flock to these sites. This year, we've seen the Great Wall of China, Angkor Wat, the Taj Mahal and the Great Pyramids. All of these places lived up to their reputations. They are still must-sees. You will always discover your own favourites lesser-known places. The people who tell you not to bother, Jenn likes to point out, have already been there. You deserve to see these places for yourself. So bring on the Leaning Tower of Pisa! 4. I am a teacher. Despite not being overly homesick, I have thought a lot about teaching. I have even had many dreams about teaching, following the school calendar in my subconscious (back to school in September, report cards in November, holidays in December...). I don't miss the work, and I'm happy to do something different for a year, but this certainly confirms that "teacher" is a big part of how I define myself. When you're a tourist, 90% of the people you meet are trying to sell you something. That doesn't change just because you're travelling for longer than the typical two weeks. It just becomes more obvious. 9% of the people you encounter, however, are just friendly people, who welcome you to their city or country, who give you directions when you're lost, who tousle your daughter's hair just because they love kids, or who otherwise serve to reaffirm your faith in the goodness of human nature all around the world. It's only the remaining 1% who are actually trying to rip you off. 6. Wherever you go, Pringles was there first. And Pizza Hut. And the Colonel, with his secret recipe. Westernization, in this consumer culture form, is far more widespread in Asia than I realized. In some ways, they do it better than us. Starbucks employees in China speak English well, and are eager for a chance to practice. In Singapore, we were welcomed across the threshold of a Ben and Jerry's by a uniformed employee gushing with pride. I don't know what the lesson is here; there are obvious advantages and disadvantages to the multi-national franchising of Western companies. Our only clear conclusion is: wherever you go, Pringles was there first. As English-as-first-language speakers, we are spoiled. It's embarassingly easy to travel around the world, and not learn anything of other languages. English is widely spoken, although spoken badly by millions. Often we're at a tremendous advantage in group conversation, where, say, a Swede is speaking with a Chinese person...in English, of course. We will get more out of that conversation than either one of them. 8. Thank God I'm a Country Boy. I often describe myself as a city kid. I'm certainly not the outdoorsy type, and I love the big cities I've been to, such as Montreal, New York, London, and San Francisco. In Asia and India, however, the cities have not usually been highlights. Often, in the developing world, we've been glad to get out of the cities and into more rural settings. Why? Over-crowding, pollution, inadequate infrastructure, begging...they are intense reminders of the disparity that exists between rich and poor. In Malaysia, for example, I wouldn't trade a dozen Petronas Towers for one Pulau Pangor. 9. There's no subsitute for reading about it. I've always been a big reader, although I haven't always had the travel bug. Reading's probably the one habit I could never break. In fact. both Jenn and I have gone out of our way to make sure we've always had "something to read" at all times on this trip. People who have travelled widely, even if they are avid readers, usually express the idea that there's "no subsitute for first-hand experience." That's true. But there's also no substitute for reading about a place. There's no way that, on any holiday, you could learn as much about a place as you could from a well-written, realistic novel. Of course, too, there's non-fiction: a few hours with a scholarly work of history will always give you more in-depth information than a tour guide. Reading and travel enrich and complement each other. Neither one can serve as a complete substitute for the other. 10. What you learn most about it is the art of travel itself. More than the history, culture, people, or even the food, what you learn the most, and it all seems incidental until you're actually doing it, is the art of travel itself. It's never a science, because you'll always make mistakes, get lost, get frustrated, and lose things. But it's what you talk about at the end of the day. Every mistake is fodder for the stories you tell later. I guess that's another way of saying "it's the journey, not the destination."